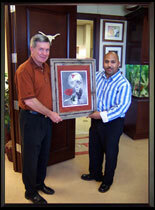 Established in 2003, Team Victorious has developed into the premier sports art source provider. Having sold over 4,000+ products and having built a credible reputation by fulfilling quality merchandise, our diverse and identifiable products continue to open doors throughout the high school, collegiate and professional markets. Artist & CEO, Nick Johnson, and his innovative style of craft allows Team Victorious to maintain its purpose as a highly recognizable brand. We serve sports fans across the nation through creative marketing and services made possible by offering original and ingenious products entailing hand drawn logos and team colors. Team Victorious represents a unique concept where individual teams become part of a select group of specialized pencil drawings. These pencil drawings encompass the spirit of being victorious on the field as well as in the stands. Each design is thoroughly researched and meticulously drawn ensuring precise accuracy and authentic detail. Each product will bear the Team Victorious logo thus guarantying a genuine Nick Johnson pencil drawing. Team Victorious specializes in creating unique products derived from original, hand drawn designs. Our products range from custom framed & matted designs and high quality lithographs to monumental displays and premium quality T-shirts. Whether you are looking to provide customized banquet awards for your athletes, wanting to fundraise by offering incomparable T-shirts, or interested in supplying your sponsors or participants with framed & matted golf designs regarding your golf/charity event, Team Victorious’ unique brand of products will fulfill your every need. Jones (right) and Nick Johnson (left) meet and greet during the Dallas Cowboys practice in San Antonio, TX at the Alamo Dome. Jerry Jones was humbled to receive the Dallas Cowboys VICTORIOUS®, 5ft X 4ft Life-Size (seen right). The monumental art piece is currently displayed in the new Dallas Cowboys stadium in Arlington, TX. The special occasion was coordinated to benefit the Gridiron Heroes Organization; Team Victorious’ official charity. Coach Mack Brown (left) and Nick Johnson (right) pose for a picture during Mack Brown’s acceptance of the Texas Longhorns VICTORIOUS®. San Diego Chargers running back, LaDainian Tomlinson (left) and Nick Johnson (right). The TCU and Chargers VICTORIOUS® designs were awarded to LaDainian following his football camp in Waco, TX.